Of course we have lots to fear in this life. There are so many ways in which we can get hurt, killed, robbed or betrayed. Everyday we are exposed to danger. Motorcars are viscous killers. Any home contains all kinds of ordinary looking things that can kill us if we are not careful. And I am not even talking about rat poison or pool acid, just ordinary stuff, which when taken in the wrong quantities can kill us, like vodka, or paracetamol or lying in a bath. But it is of course not logical or acceptable to live in fear of bathwater, electricity or a motor car just because it can, in certain circumstances, be deadly. It seems though that we discriminate differently between Urban dangers and rural dangers. Or so it seems this week with the excitement caused by the appearance of two (very small) snakes in our rainwater tank. I have builders working on site and they were terrified. It effected their work. Some in my family too, (I dont want to mention any names) are hinting at not ever returning to the farm that is loved by all of so much. Of course I as a husband and a father must make every effort to understand that not all of us are the same and that some and may have different loves and fears. I understand this. It is not good enough for me to explain that as we warm up into summer, the snakes will be on the move and we should be on the look out. Anyway, the snakes turned out to be two Spotted Bush Snakes Philothamnus semivariegatus. (thanks to the people at snakesofsouthafrica for help with the identification) which are not poisonous at all. 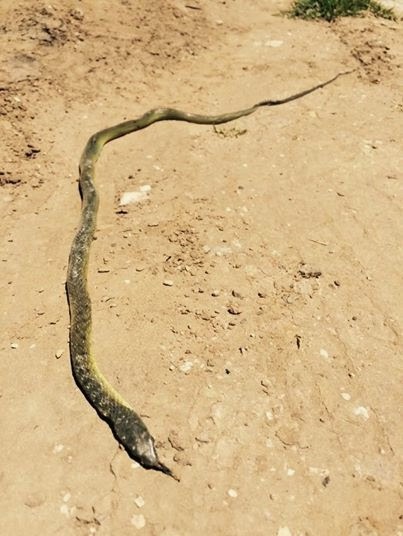 There are dangerous snakes on the farm, like the Puffaders that like to lie on a sunny path waiting to be stepped on. What I am trying to say though, is that we are confronted everyday with a strong bombardment of ideas of what is “normal” and what is not. We are told that “Normal” is to work in a cubicle, commute to work in a Toyota Corrola, and watch rugby on Saturdays. So it is with normal dangers that confront us every day in the city. Because they are “normal” we tolerate them. Even when they kill us, we continue to tolerate them. But snakes, scorpions and frogs are “abnormal” dangers and they are to be eradicated, chopped into little pieces, burned, poisoned and obliterated. Such is the logic of our time. So, while I can see that all this, to keep the peace I have had to make a visible effort to do something about the snakes. So I have cleared all the longer grass around the house and reduced the number of places snakes can hide. And also very cleverly I have installed a very innovative anti snake device onto my watertank. You can watch the video if you like. Previous Previous post: So, How have the cows been?